Instructions: Click here to view a larger photo of this project. Fold a piece of white card stock to create card base. Slide the side of the pansy arrangement die from the Burst of Spring Cling Stamp Set slightly off the fold to create a shaped card base. Using a low tack tape to hold die in place, run through your die cutting machine. Using Ranger Archival Ink - Black, stamp both images from the Burst of Spring Cling Stamp Set, as well as one inking of each of the mid-sized and smallest sized pansy flowers, as well as the foliage illustrations from the Cheery Pansy Cling Stamp Set. Using Stack and Store Daubers, color center of pansies on all images using Ranger Archival Ink - Sunflower, around the yellow center add Ranger Archival Ink - Forget-Me-Not, and then color outer edge of petals using Ranger Archival Ink - Deep Purple. Color vase arrangement using Ranger Archival Ink - Sunflower. Color foliage using Ranger Archival Ink - Olive. Die cut all images using coordinating dies. 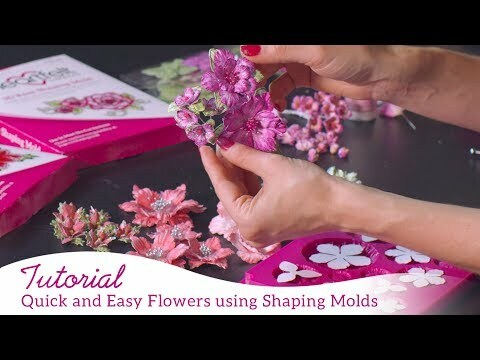 Shape pansy flowers and foliage using 3D Pansy Shaping Mold and assemble one mid sized flower and one small flower according to video link above. Adhere stamped and colored pansy arrangement die cut to card base matching up the die cut edges. Adhere large pansy bouquet to card base over top bouquet in container. 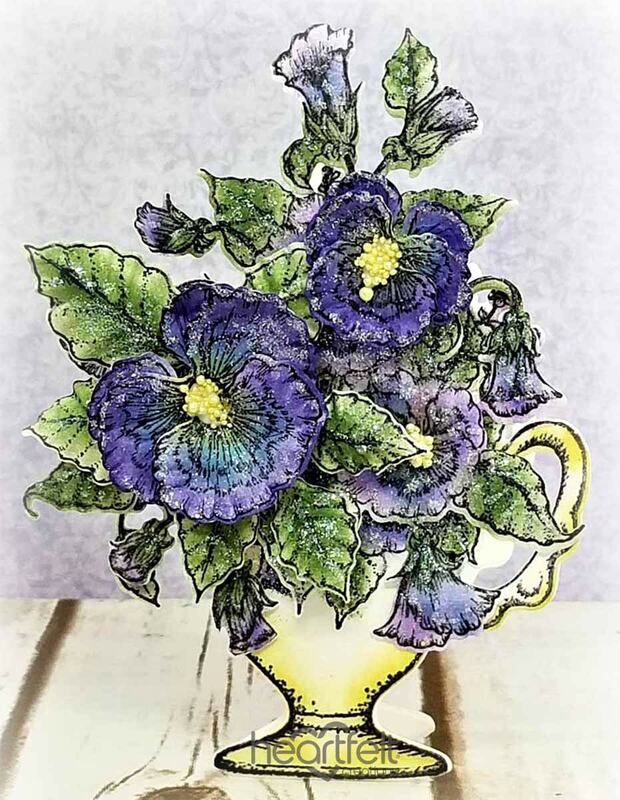 Adhere shaped pansy flowers and leaves to card as shown. Using Designer Dries Clear Glue and fine metal glue tip, adhere Crystal Ultrafine Transparent Glitter to all images, and prills to flower centers.